SEATTLE—The Port of Seattle joined with a broad range of maritime stakeholders in support of Governor Jay Inslee’s ‘Maritime Blue Strategy’ at the official kickoff meeting today at Pier 66. The Strategy aims to advance the region’s maritime-based, “blue economy” through increased collaboration between its diverse sectors to promote innovation and sustainable practices that support a competitive gateway with a 21st Century workforce. Port of Seattle Commissioner Fred Felleman served as a member of the Maritime Blue Advisory Committee. The Maritime Blue Strategy aims to make Washington State home to a world-class, thriving and sustainable maritime industry by 2050 in partnership with business, academic and research institutions, ports, labor, and community organizations. "I welcome the opportunity to support the development and implementation of Governor Inslee's Maritime Blue Strategy representing the Port of Seattle on the Innovation Advisory Council," said Commissioner Felleman. "The Port is committed to creating a competitive maritime gateway, based on industry and labor prospering while decreasing their carbon intensity and environmental footprint. There is no better region in the nation to lead this effort than the Pacific Northwest where our maritime heritage runs deep and the spirit of innovation is part of our cultural fabric." The Maritime Blue strategy calls for a Maritime Innovation Center on Port property for research and development and commercialization of innovation technology through public/private partnerships. The strategy also calls for greater electrification of maritime facilities to improve community and environmental health and create more opportunities on the working waterfront. Port of Seattle commissioners included funding plans for both projects in their 2019-2023 budget blueprint, approved in November 2018. The Maritime Innovation Center, be considered for Fishermen’s Terminal, will house incubation, acceleration, co-working and public meeting space. The center will act as a hub to the many spokes of maritime communities across the state. Commercial fishing and cruise companies co-locate at the Port of Seattle’s Terminal 91. Commissioners also approved a funding plan to bring shore power to the current cruise berth at Pier 66, take next steps towards electrifying the Seattle waterfront and to provide shore power at Terminal 5. The Port will also continue its workforce development to train and recruit the next generation of workers, another key component of the Maritime Blue strategy. Since 2015 the Port has tripled the size of its internship program to serve more than 100 high school and college students. In 2019 the Port will invest almost $3 million in workforce development funding to support apprenticeship training and retention and support regional efforts to increase the number of women and minorities on our job sites. Environmental demonstration projects to reduce carbon emissions have also been a key source of innovation at the Port of Seattle. Reduction in emissions by transition into electrification and renewable fuels has been a priority, with shore-power available for cruise ship plug-in at our busiest cruise terminal, and efforts to find alternatives to jet-fuel at Seattle-Tacoma International Airport already underway. The Port is also in the process of installing solar cells on several of its buildings and has started a “blue carbon” pilot project that uses marine plants and shellfish to sequester carbon from the atmosphere and Puget Sound waters. Moving forward, the Port of Seattle is poised to fulfill the key tenets of the Maritime Blue Strategy for a growing economy, healthy ecosystems, and resilient communities. Existing partnership programs near Sea-Tac Airport and the Lower Duwamish will continue to engage underserved communities in those areas while growing the labor pool needed for growth in maritime and industrial job sectors. Founded in 1911, the Port owns and operates Seattle-Tacoma International Airport, Fishermen’s Terminal—home of the North Pacific fishing fleet—and public marinas. 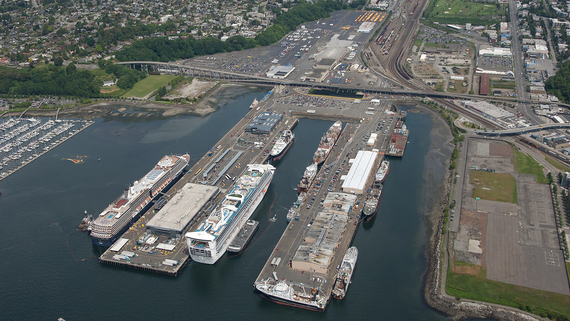 The Port also owns two cruise ship terminals, a grain terminal, real estate assets, and marine cargo terminals through its partnership in the Northwest Seaport Alliance. Port operations help support nearly 200,000 jobs and $7 billion in wages throughout the region. Over the next 18 years, the port’s “Century Agenda” seeks to create an additional 100,000 jobs through economic growth while becoming the nation’s leading green and energy-efficient port. Learn more at www.portseattle.org.